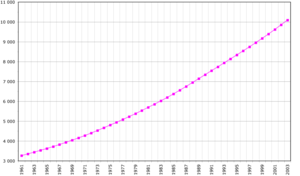 Demographics of Senegal, Data of FAO, year 2005 ; Number of inhabitants in thousands. About 70% of Senegal's population is rural. In rural areas, density varies from about 77 per square kilometer (200/mile²) in the west-central region to 2 per square kilometer (5/mile²) in the arid eastern section. About 50,000 Europeans (mostly French) and Lebanese reside in Senegal, mainly in the cities. French is the official language but is used regularly only by the literate minority. Almost all Senegalese speak an indigenous language, of which Wolof has the largest usage. A lot of Senegaleses are emigrated in Europe, particularly in France, Italy and Spain.